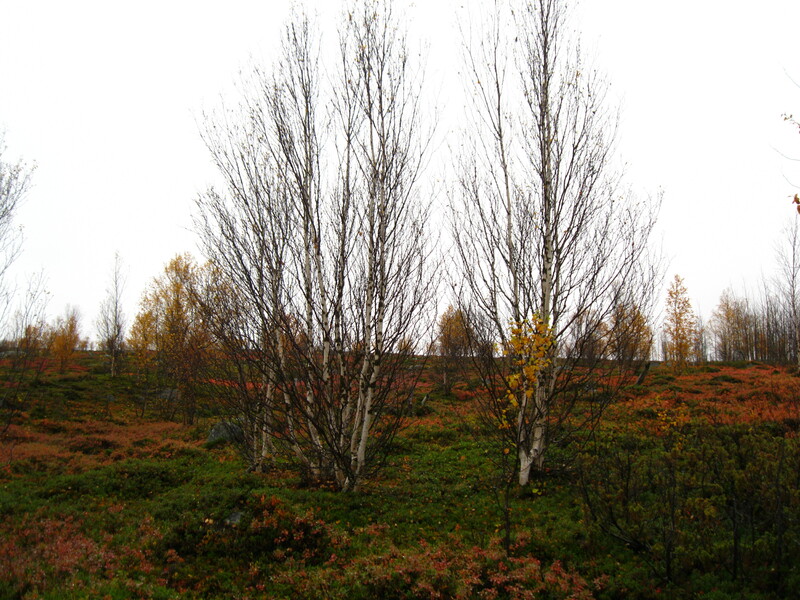 In the time since I’ve come to the Kevo field station, Lapland has undergone the ‘ruska-aika’ (roo-ska-eye-kah), which literally means ‘brown time’, but is the word in Finnish for the season when the leaves of the northern birch forests change color. Perhaps because I’m not from the northeastern US where they have also made a tourist industry out of senescence, but I can’t think of an equivalent word or phrase in English that describes this specific window of time for the forests. 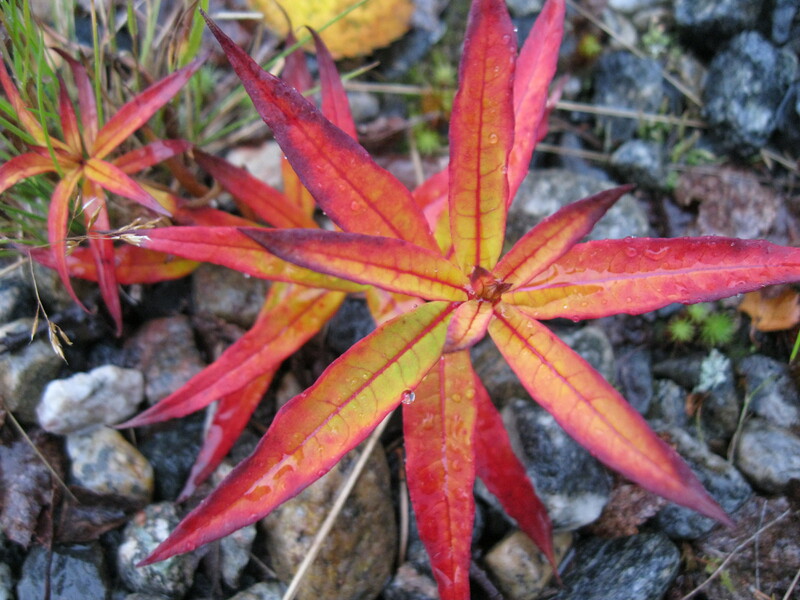 Much like in the states, the ruska-aika draws quite the crowd from the more southern parts of Finland. 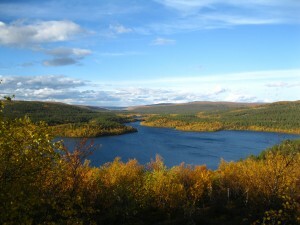 Busloads of camera-toting people have flooded the Utsjoki area in the last few weeks to revel in the golden-leaf splendor. I myself had a photo project for the ruska-aika – every day (weather permitting) after dinner I did a short hike up to the highest point of the peninsula the station is situated on, and took a picture of the same scene. The view is of the outlet to the Utsjoki river, which flows through Kevo lake and continues north up to the village. This was my attempt to capture ‘the change’. I’m not really sure it worked the way it did in my head, but it made for some really nice photos, shown here, in chronological order! 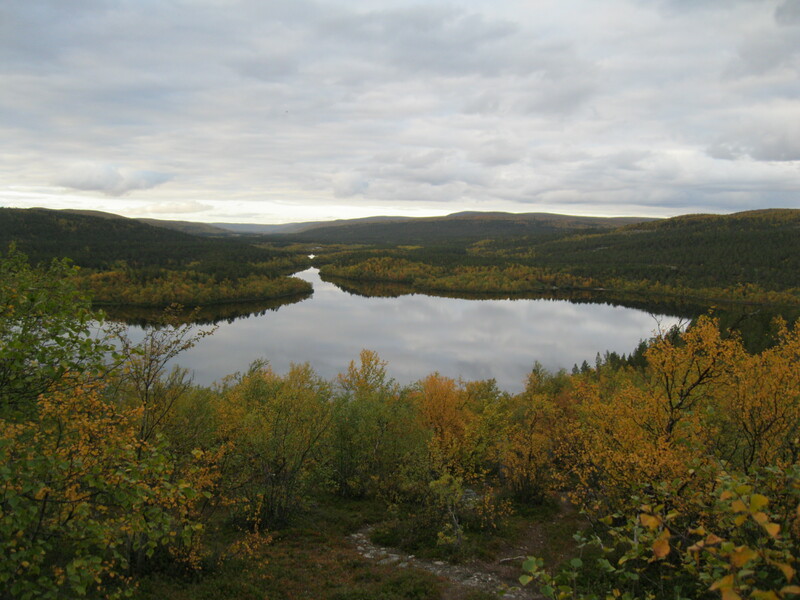 My first few days back from Helsinki, I accompanied a small band of station staff out to a small lake about 5km west of the station. 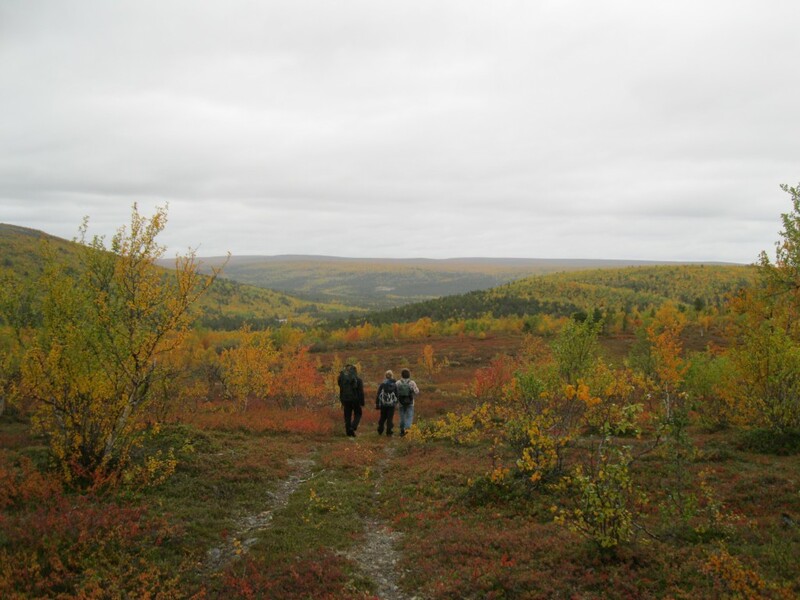 This hike afforded some excellent views of the folliage, as well as the 3 rivers converging around the Kevo field station. 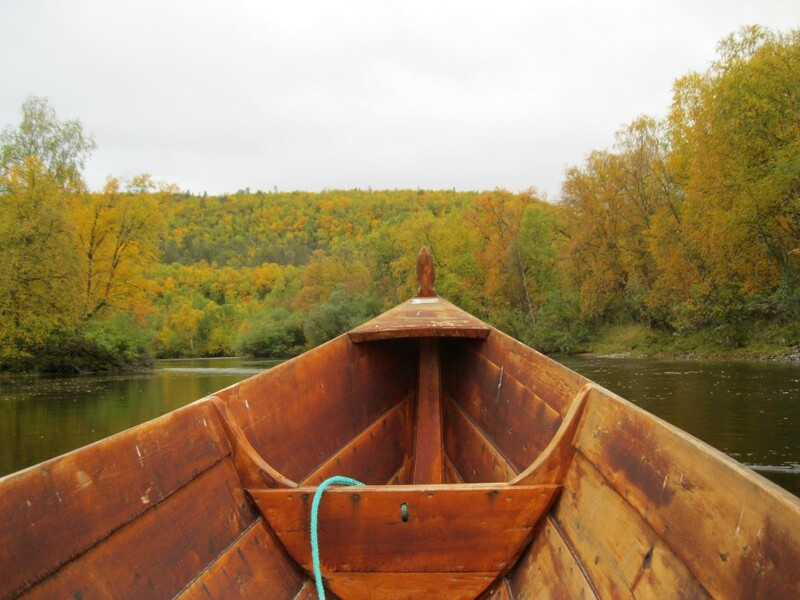 And how often are you given the chance for a guided boat trip and hiking through the Finnish forests during the peak of ruska-aika?! 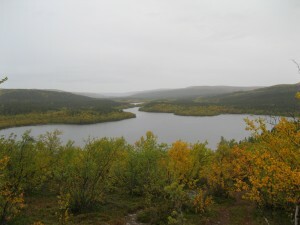 We started by taking a boat across Kevo lake, and then a ways into the Kevo river, shown below. 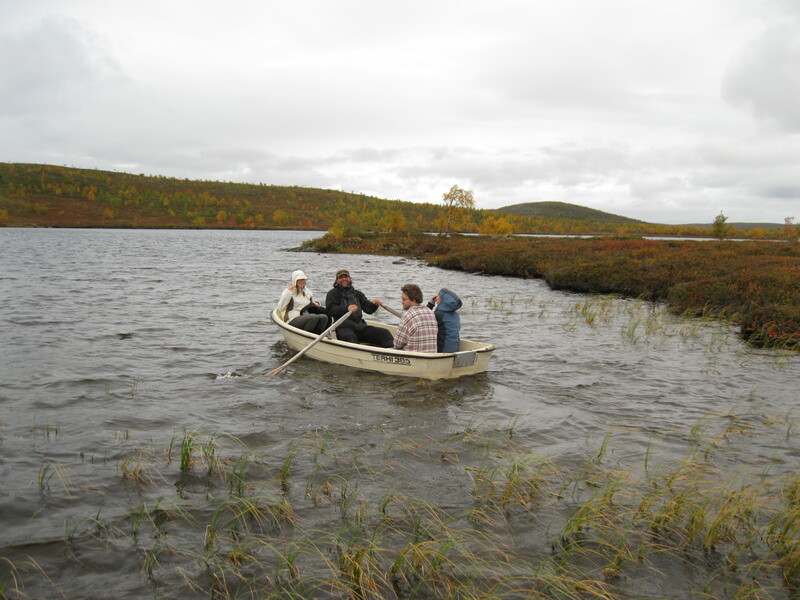 Once we made it out to the little lake, Ilkka rowed the rest of the crew out to take water samples from the center of the lake, and I played around in the wetlands along the coastlines. 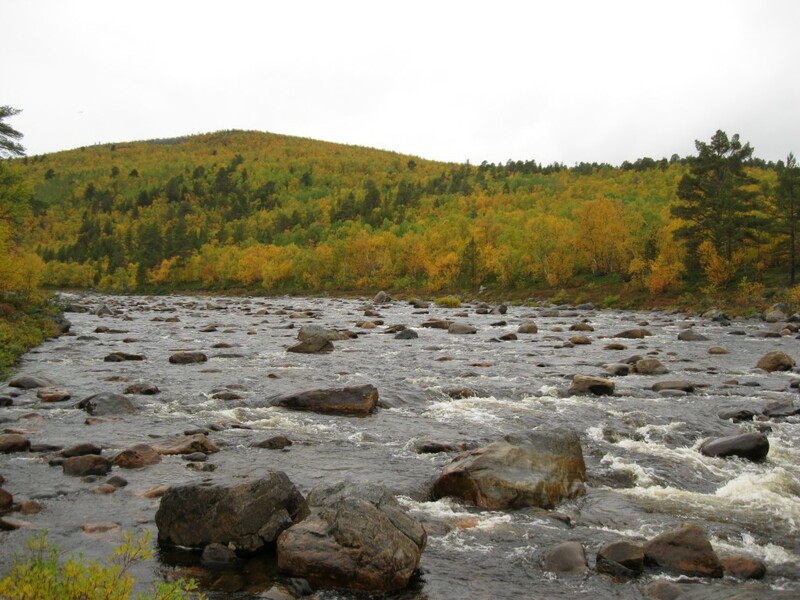 And this is the Tsarsjoki river, the shores of which we walked along for quite some time. This river, along with the Kevo river, empty into Kevo lake, eventually converging into the Utsjoki river! 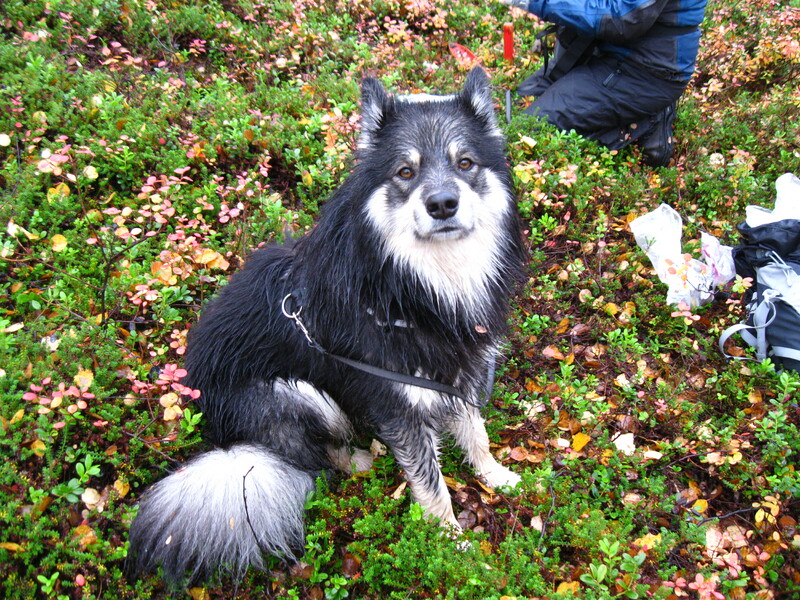 I also had a nice encounter with the tail-end of the ruska-aika this week when I accompanied Heini on a field excursion. This is Heini (of the berry-studying fame). 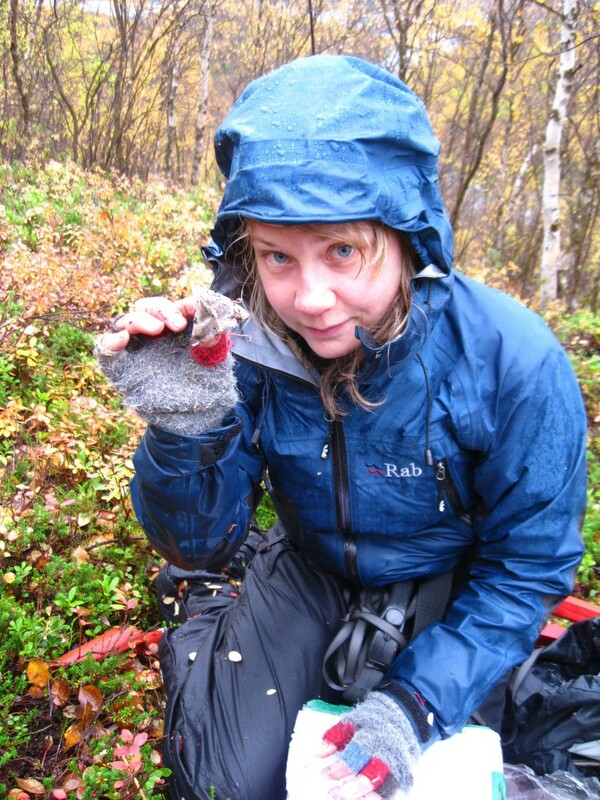 She was tasked with retrieving tea bags that were buried to measure decomposition. I’m not dumbing down the science here – they buried tea bags (green and red teas) a few centimeters below the surface of the soil, and left them there for either 3 or 12 months. They then get dug up, dried and weighed them to determine how much of the tea within the tea bag was decomposed and ‘left’ the tea bag. Heini graciously allowed me to tag along with her so that I could escape the vacuum of data processing that has been keeping me chained to my computer all day for the last few weeks. We also brought along an in-training reindeer dog. 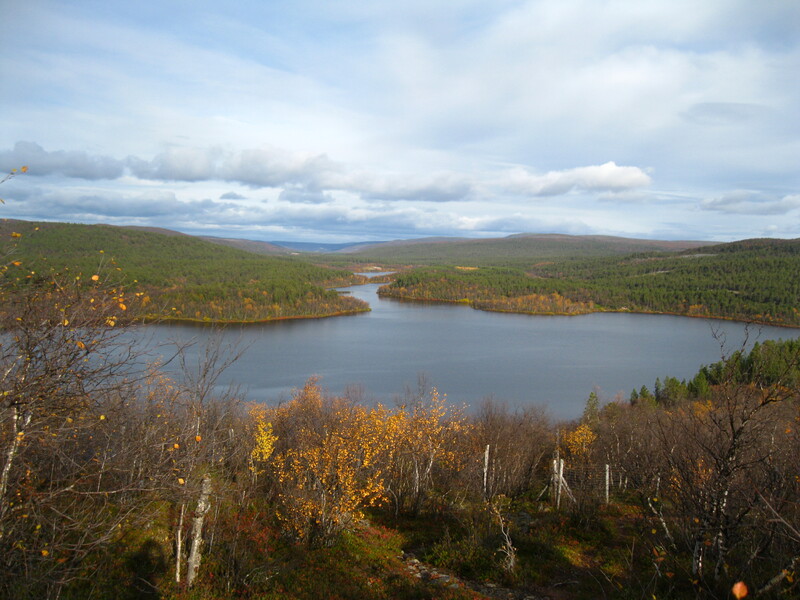 The reindeer herding is beginning next week here in Utsjoki. This means that for the next couple of months, the reindeer farmers will be gathering up their herds and temporarily containing them in large corrals. They ear-tag all the new calves, retain those that will soon meet their maker (and the grocery store shelves), and release the rest. 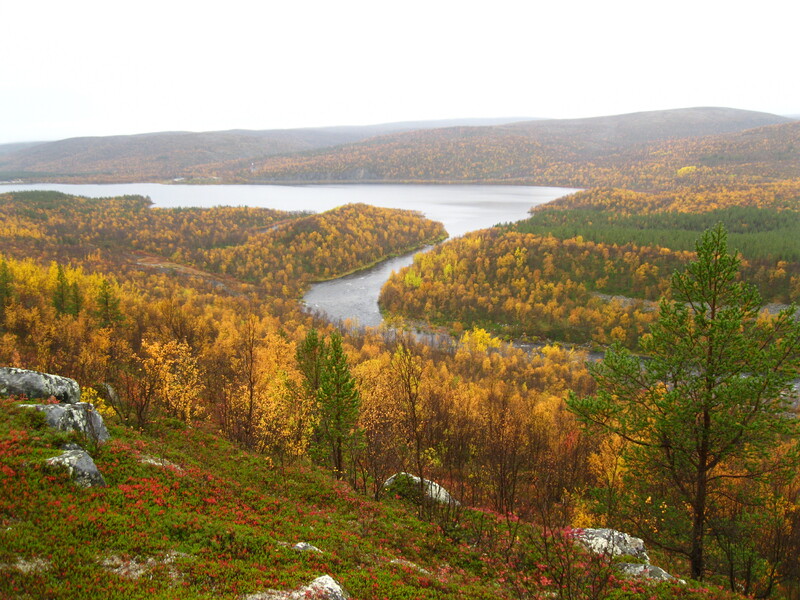 The autumn is the only time when the reindeer will be herded together here in Utsjoki (the number of roundups each year is farm/area-specific), and otherwise the reindeer roam about the countryside and mostly fend for themselves. There are fences all over the place, so there are some areas that are clearly not open to the reindeer, but there are so many fences that I think you’d need to be airborne to see any patterns, or understand when you’re in the ‘open’ versus the ‘closed off’ areas. So this is a reindeer dog. 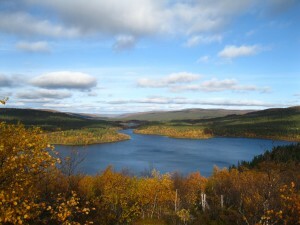 The name of the breed is literally translated from Finnish as such. 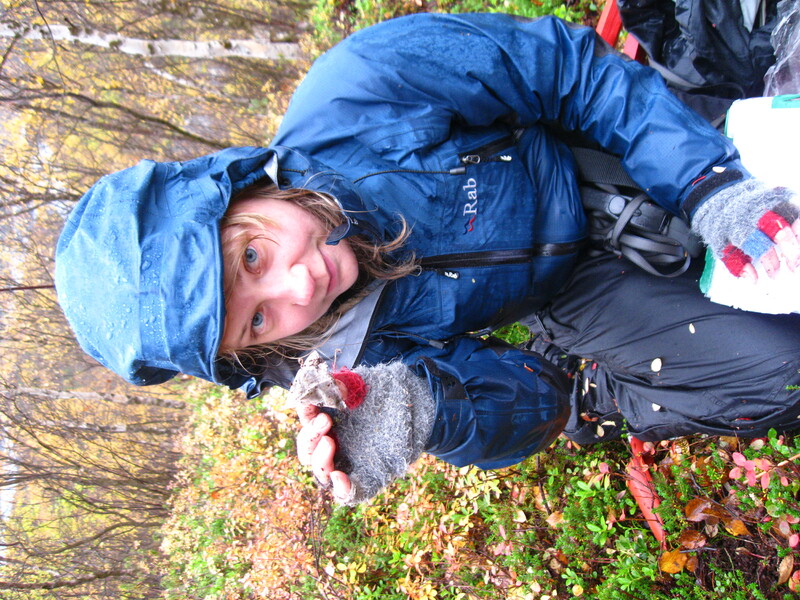 This little beastie belongs to the field station’s logistics coordinator, Elina. His name is Tuisku (too-skoo). 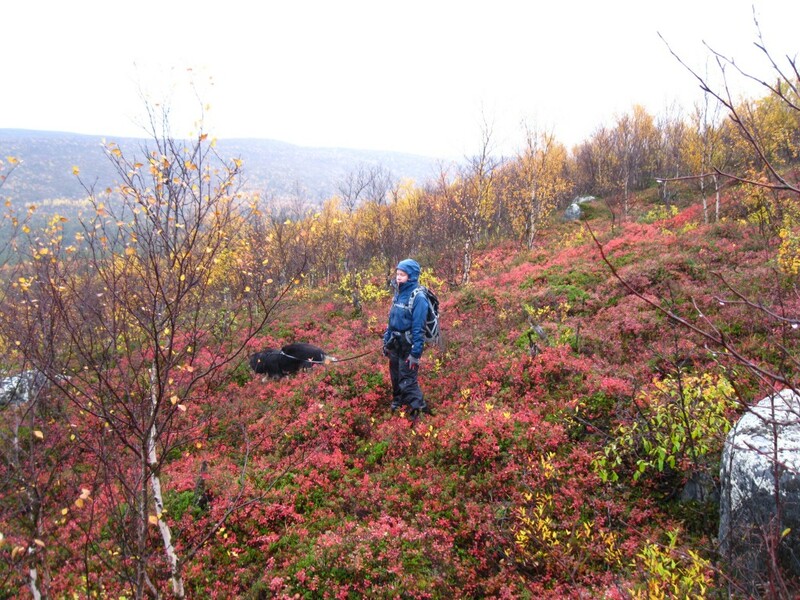 As a reindeer dog, he is supposed to bark when he smells or sees reindeer, and then help herd them wherever you tell him. He’s really good at the barking part, but he was on a leash, so I can’t attest to his skills at the actual herding. We did run into a pack of reindeer at one point, and he went ballistic. The reindeer took off, moving together like a flock of birds – it put me in mind of the dinosaurs in that one scene of Jurassic Park when they were schilling the avian evolution theory. It was actually pretty awesome to see them moving in such a uniform and graceful configuration. 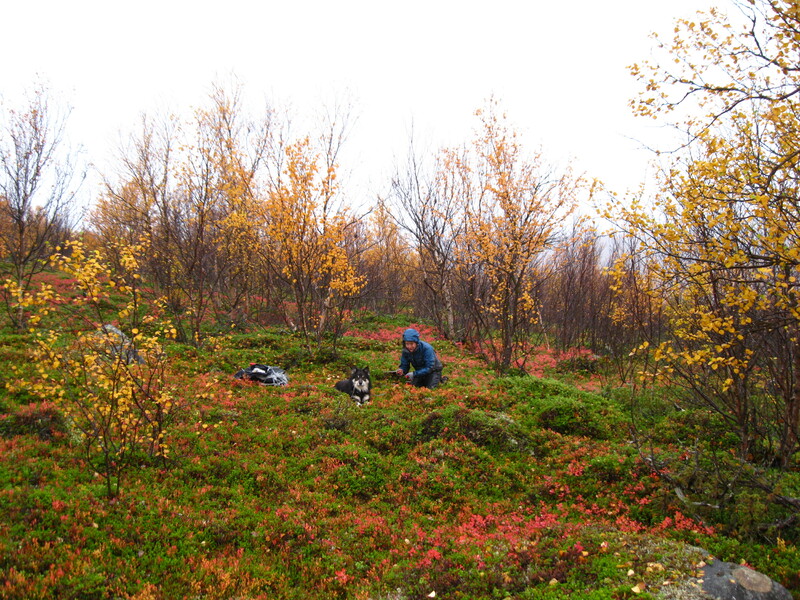 There were parts of the hike where leaves were still on the trees, and the colors were amazing. 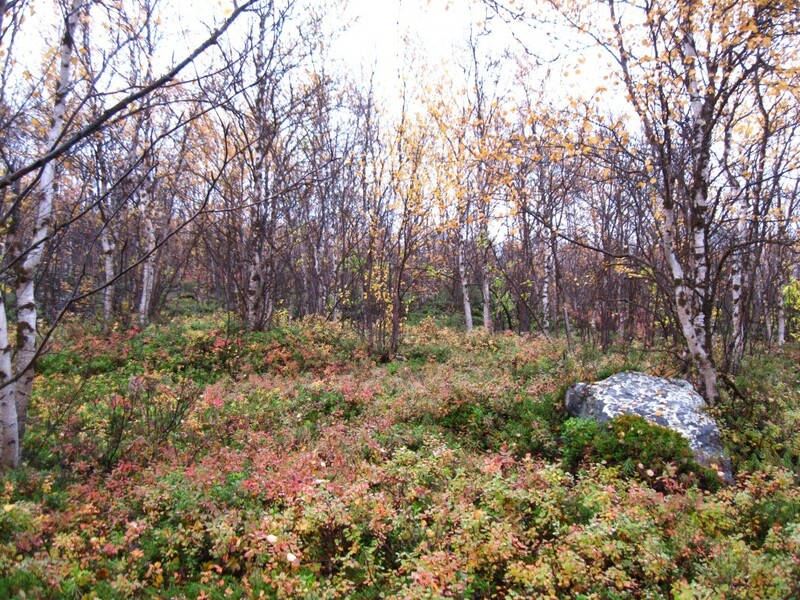 I felt like this part of the forest would have been the perfect setting for A Midsummer Night’s Dream. The undergrowth is so fluffy and sparkly, and surprisingly almost knee-deep! Our hike took us from the area where the reindeer will be corralled (pictures of this area in previous post, btw) all the way to the village of Ustjoki, a distance of about 20km. 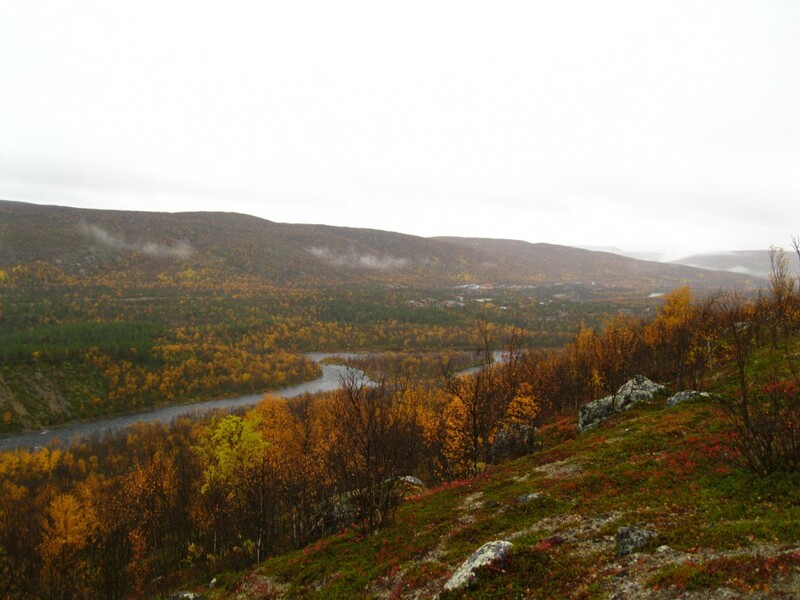 It was super pretty the whole way, although the weather left something to be desired in the way of visibility, as it was either too foggy to see more than a few hundred meters, or it was raining. 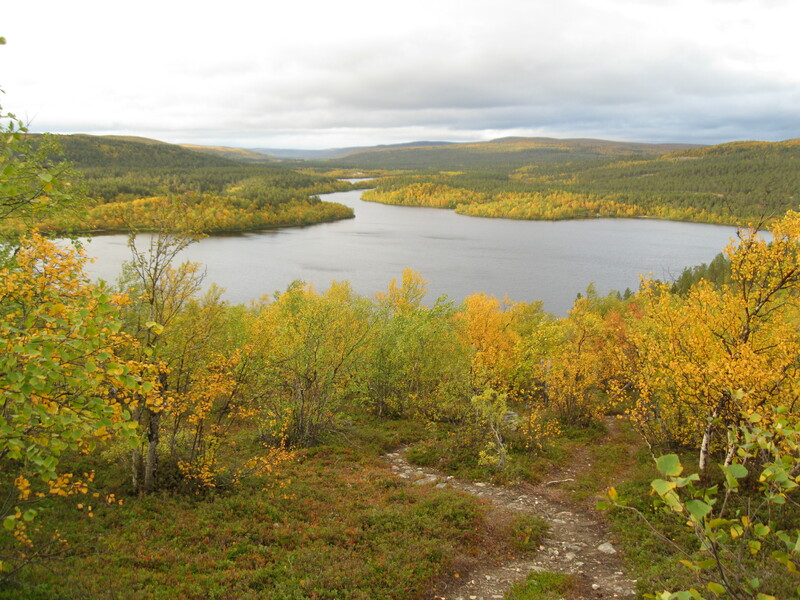 Even so, it was a great hike, and it was fun getting to chat with Heini all day – I’m counting her as a friend at this point, which means I’ve made my first Finnish friend! Woot-woot!! 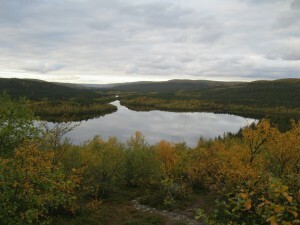 Nearing the end of the trek, we followed the river the village is named for – the Utsjoki (‘joki’ actually means ‘river’). We could see the whole village from the higher areas – it’s the clusters of buildings in the distance along the banks of the river. 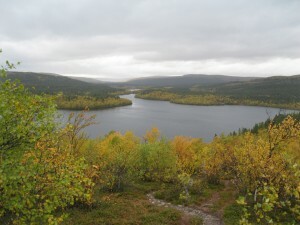 To get to town, we had to walk along the river and then rejoin the road and the village right at the border with Norway. 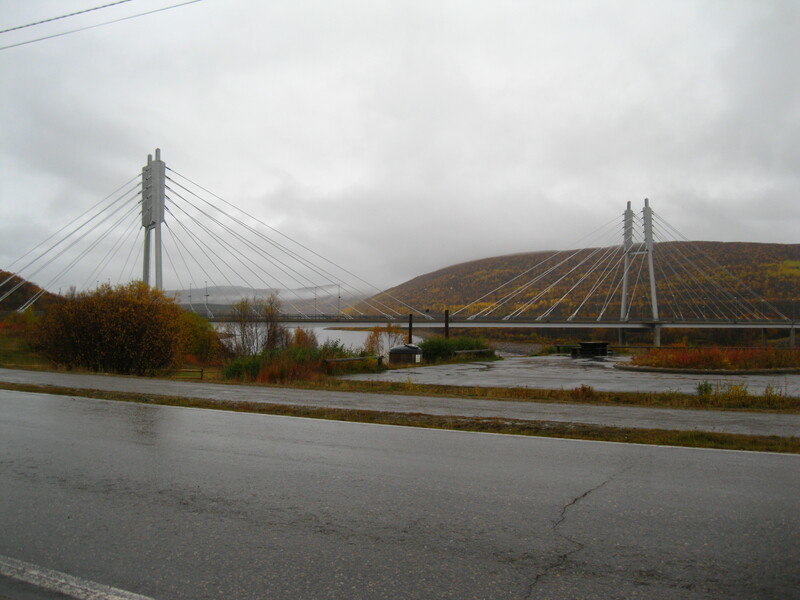 This is the bridge that divides the two countries. 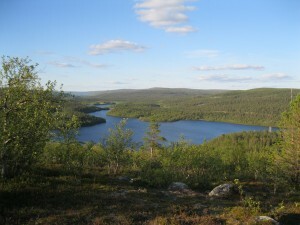 Left = Finland, Right = Norway. 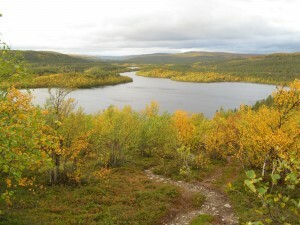 So that’s the ruska-aika 2012, Utsjoki-style. 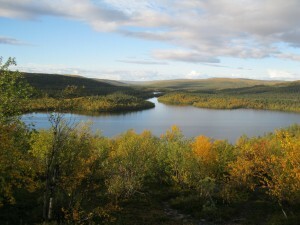 Speaking from a completely biased point of view, I’d say that Vermont and the like can eat their hearts out. 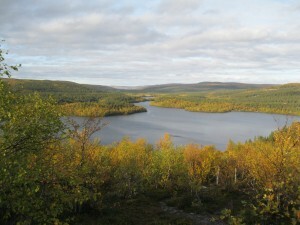 Finland wins ‘Battle: Beautiful Autumn’. 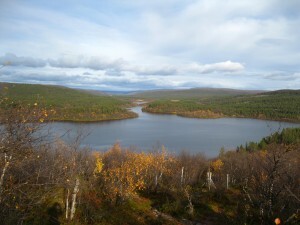 This entry was posted in Kevo by Kim. Bookmark the permalink.